shoes, or walking or running on an uneven surface. 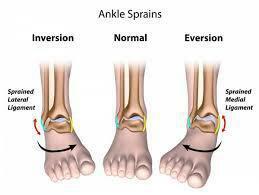 Sometimes ankle sprains occur because of weak ankles, a condition that some people are born with. Previous ankle or foot injuries can also weaken the ankle and lead to sprains. swelling are absent in people with previous ankle sprains—instead, they may simply feel the ankle is wobbly and unsteady when they walk. Even if you don’t have pain or swelling with a sprained ankle, treatment is crucial. Any ankle sprain—whether it’s your first or your fifth—requires prompt medical attention. If you think you’ve sprained your ankle, contact your foot and ankle surgeon for an appointment as soon as possible. In the meantime, immediately begin using the “R.I.C.E.” method—Rest, Ice, Compression, and Elevation—to help reduce swelling, pain, and further injury. include a serious bone fracture that could lead to troubling complications if it goes untreated. determine the severity of the injury. When you have an ankle sprain, rehabilitation is crucial—and it starts the moment your treatment begins. promote healing and increase your range of motion. This includes doing prescribed exercises. ensure that your ankle heals properly and function is restored.